Polymers have been widely used as piezoelectric materials in the form of films and bulk materials but there are limited publications on piezoelectric fibre structures. In this paper the process of preparing piezoelectric polyvinylidene fluoride (PVDF) fibres from granules by continuous melt extrusion and in-line poling is reported for the first time. The poling of PVDF fibres was carried out at an extension ratio of 4:1, a temperature of 80 ◦C and a high voltage of the order of 13 000 V on a 0.5 mm diameter fibre in a melt extruder. The entire process of making PVDF fibres from granules and poling them to make piezoelectric fibres was carried out in a continuous process using a customized melt extruder. The prepared piezoelectric fibres were then tested using an impact test rig to show the generation of voltage upon application of an impact load. PVDF granules, unpoled fibres and poled fibres were examined by Fourier transform infrared spectroscopy (FTIR) which showed the presence of β phase in the poled fibres. The ultimate tensile stress and strain, Young’s modulus and microstructures of poled and unpoled fibres were investigated using a scanning electron microscope (SEM). 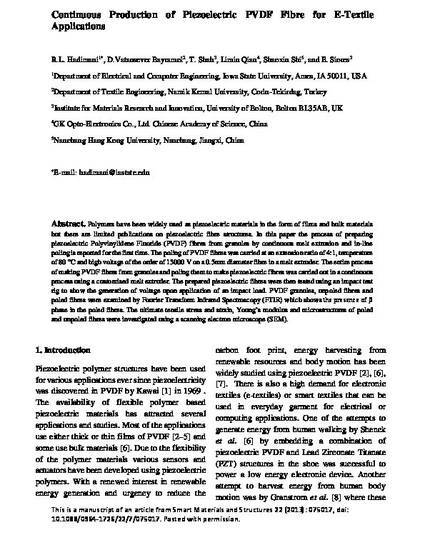 This is a manuscript of an article from Smart Materials and Structures 22 (2013): 075017, doi: 10.1088/0964-1726/22/7/075017. Posted with permission.